I didn't realize it, but this note is on a calendar page. 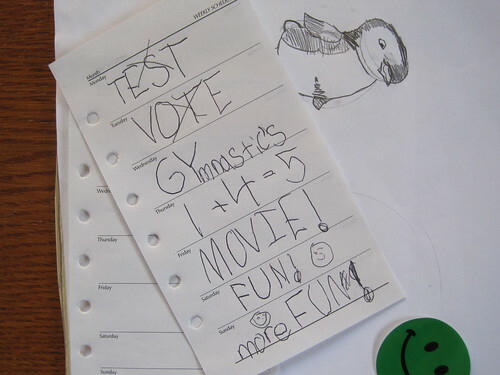 Monday: She had a kind of a midterm for spelling. Tuesday: She was going with Mom to vote. Thursday: She had math homework due. Friday: She had a night at Wendy's Gymnastics where they play and watch a movie. Saturday: Stay home day, all fun. I love how the "more FUN!" smiley face has a bigger smile than the "FUN!" smiley face. To create about this topic is very fearless decision. I hope you’ll suspect more the compression that may push customers into using essay writing services, and the ways we might try to inch those heaviness and not simply synthesize them. Anyway, thanks for the doctrine for better the importance of essay writing for those who value it as a aspect of learning exercise.